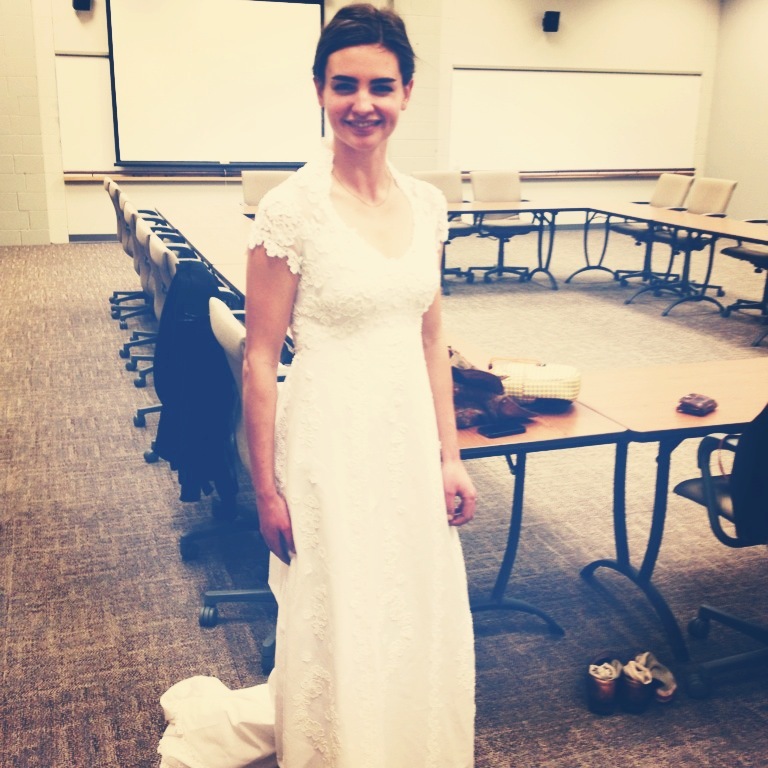 On Monday afternoon, I met up with a betrothed blog reader, Sarah, to preview Goodwill MN’s Wedding Showcase. We spent a super fun couple of hours, perusig rack after rack after rack packed with gorgeous gowns—600 in all, in sizes 4 to 28. At first, I erronously assumed that the dresses at this annual event were donated gowns, collected throughout the year, but that is so not the case! 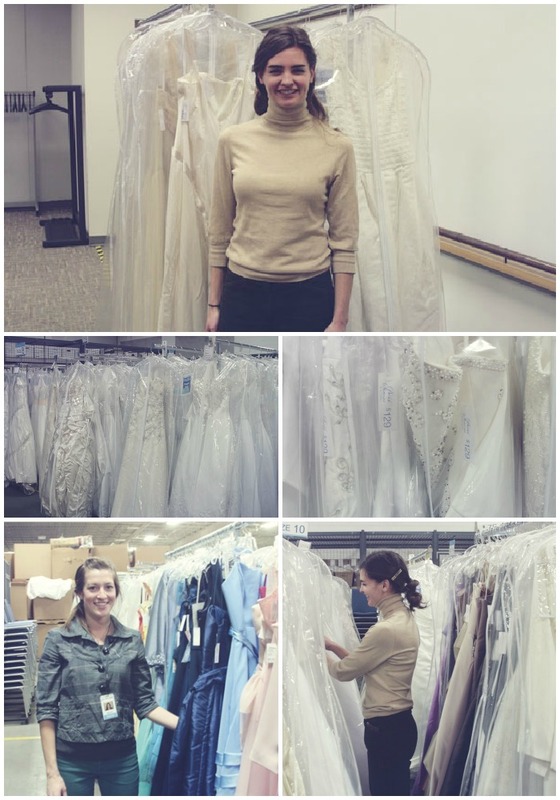 Goodwill actually solicits donations from local bridal boutiques and superstores, netting an impressive stash of brand-new gowns, supplemented only in part by once-worn dresses and floor samples. (Bad news for us vintage lovers, but great news for the “regular” population!) A whopping 90 percent of the dresses are priced under $299, including never-been-worn design gowns! Not only do dresses range in size, but they have a huge array of styles as well. Strapless. Sequined. Beaded. Pleated. Silk. Satin. Princess. Modern. (Some) Vintage. Seriously, if you’re looking for a wedding dress, there will be something for you at this sale. Equally impressive was the stash of bridesmaids (hello prom! ), mother-of-the-bride, flower girl (also great for First Communion!) dresses, also available in a rainbow of colors, styles and sizes. Brides looking to get “jacked up” can pick through veils and lacey boleros; there are heaps of slips and crinolines too! Here are some pro tips, as shared by the event’s Coordinator, Alyson Coleman! ♥ Come early! More than 700 ladies came through the door last year and lines started forming at 8! ♥ For modesty’s sake, wear undies, a bathing suit or bring a slip. Changing rooms, decked out with on-site seamstresses, pedestals and mirrors, are of the group variety. High Plains reader Sarah, on the hunt for a non-poufy, sleek and comfortable gown for her July farm wedding, found an entire rack’s worth of dresses to try on (including two gorgeous Vera Wang silk beautifies! ), with this beautiful handmade, lace-y 1970s number being the crowd favorite. When: Saturday, February 23, 9 a.m. to 3 p.m.
Are dress previews available? You betcha! Are credit cards accepted? Yep! This entry was posted in Uncategorized and tagged Alyson Coleman, bridal showcase, budget wedding, frugal wedding, Goodwill, heads up, St. Paul, thrift shopping, thrift-store shopping, thrifted wedding, thrifting, vintage wedding, wedding dresses, weddings by highplainsthrifter. Bookmark the permalink.